An event for the guys…..
Jo’burg Child Welfare is having a fundraiser on the 29th of October at Killarney Country Club in Johannesburg. 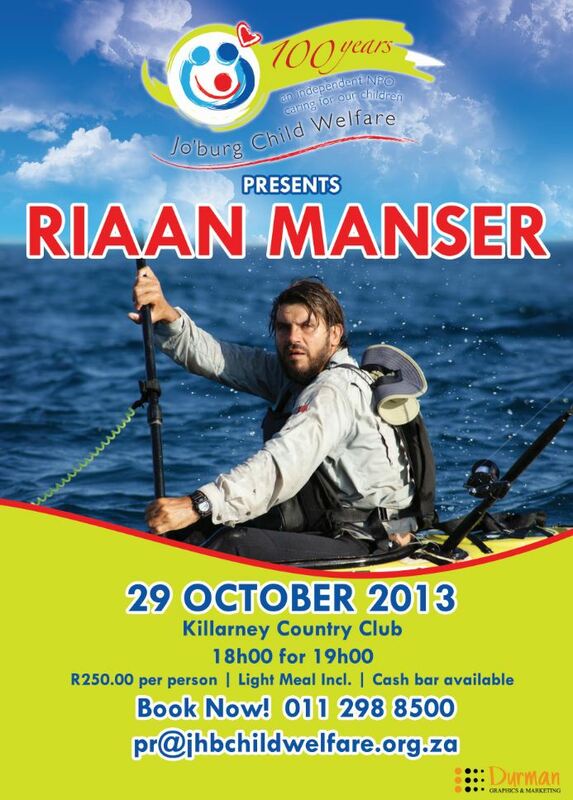 Come and meet guest speaker Riaan Manser. Riaan became the first person to cycle around Africa in 2006. Over two years, alone and unaided, he pedalled 37,000km through 34 countries. In 2009, Riaan paddled 5000km in eleven months to become the first person to circumnavigate Madagascar by kayak. And more recently he battled Arctic elements with partner, Dan Skinstad, paddling 2300km in five months in a double kayak to circumnavigate Iceland. “Hard, gritty, strong, emotional, frightening and DEEPLY INSPIRATIONAL”.